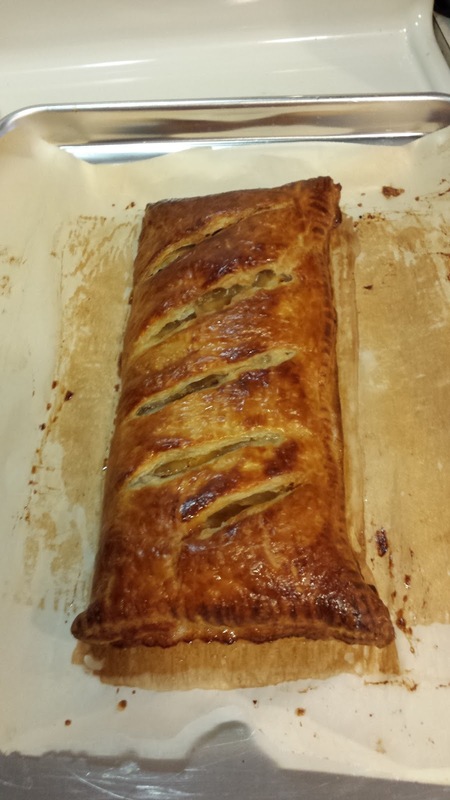 Ever since I discovered puff pastry, I have loved its ease and versatility. I use it for cinnamon rolls instead of a heavier yeast dough, and for making a savory dinner dish like this one. I use mix mustard and fig jam together for a sweet/tangy accompaniment to the ham and cheese, and it cuts the richness of the puff pastry. The hardest part is planning ahead and taking the puff pastry out of the freezer the night before I make it; I prefer to thaw it in the refrigerator, but have done it on the counter in a pinch. My husband likes this also, and I mix it up sometimes by using only one sheet and baking it open-faced. While puff pastry isn’t in any sense a “diet” food, using one sheet instead of two cuts the calories. Unfold one sheet of puff pastry on a flour-lined board. Roll it out to a smooth rectangle. Transfer to prepared baking sheet. Mix the mustard and fig jam together; spread over the puff pastry, leaving a 1/2″ wide border all around. Place the ham evenly over the mustard/fig spread. Lay the cheese over the ham. Roll out the second sheet, if using it. Moisten the 1/2″ border with water, and carefully place the puff pastry top over the layered ham and cheese. Use a fork to seal the edges. With a small sharp knife, cut slits in the top to allow steam to escape. Make an egg wash with the water and beaten egg, and brush over the top of the puff pastry. Cook for 20-25 minutes, or until the top is puffed and golden. Remove from oven and allow to cool for 5 minutes before serving. This makes a tasty dinner or delicious appetizers if cut into smaller portions. I’ll be at Malice Domestic April 27-30, in Bethesda, MD. Hope to see you there! I love using puff pastry – it’s endlessly versatile, it can be used for both sweet and savory dishes, and it’s easy to create a dramatic dish. Best of all, it’s easily obtainable at the grocery store. This is a fast and easy meal; I had it on the table less than an hour after walking in the front door. The key is to plan ahead at least one day, to give the puff pastry time to defrost. It is best to defrost it overnight in the refrigerator; it can be harder to handle if it defrosts unevenly. On a piece of parchment paper, lay out the sheet of puff pastry. Use a rolling pin to smooth out the seams. Loosen it from the parchment paper. Lay the parchment paper in a baking sheet, and put the puff pastry on it. Mix the mustard and fig preserves together; brush over the puff pastry, leaving a 1″ border. Lay the cheese in one layer over the mustard and preserves; lay the ham over the cheese. Brush the egg wash all around the border. Carefully fold one half of the puff pastry/ham/cheese over the other half; crimp the edges to seal. Brush the top with egg wash, and cut slits in the top to vent. Bake for 20-25 minutes, until the top is golden brown. Remove from oven and let sit on a cutting board for a few minutes before cutting. Delicious with a green salad, or some fruit. If you are serving more than two people, double the ham, cheese, mustard, and fig preserves. Use both sheets of puff pastry, filling the bottom of one and topping with the other. Cooking time remains the same.